Submarines are fascinating vessels. The opinions of airdales aside, submarines are arguably the most important vessels in any modern navy. Naval aviation is useful enough, but it only takes one submarine to put a carrier out of action, and without the carriers the planes don’t mean very much. From the earliest days, the admirals wanted to find a a way to integrate submarines into the fleet. The idea was to utilize them as scouts, using their ability to dive to let them spy on enemy fleets, and their torpedoes to remove the lighter enemy units from the equation. After that, the battleships would shoot it out and decide the war. This never happened. Instead, the submarine found its place in the guerre de course, or commerce war. In two World Wars Germany used their U-boats in a campaign to close the north Atlantic convoy routes, with the intent of isolating England and forcing her to surrender. Germany never quite succeeded in this, though only because there were never enough U-boats to do it, but in the Pacific, during World War II, the United States, by concentrating its submarine campaign against the Japanese merchant fleet—with the odd, opportunistic attack on a major warship—actually did succeed in sinking nearly all of the enemy’s merchant bottoms. The articles on these pages explain various aspects of submarine technology. Some of these are distinctly German, some American, and some are applicable to any submarine. And just in case anyone isn’t already aware of it, Unterseeboot (U-boat) is simply German for submarine, and not a special term for particular type of submarine. Photograph of U.S.S. 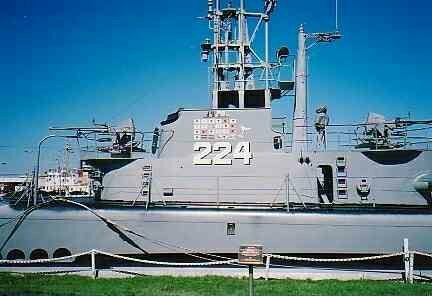 Cod (SS-224) at her permanent berth in Cleveland, Ohio. Photo © J.T. McDaniel.